Today I’m being brave and sharing this old “From the Vault” nail art tutorial I found on a previously lost SD card. I’ve been debating sharing some of these older manicures and tutorials because they are nearly a year old, and I like to think my recording and photography skills have at least improved a little since then. At the time, in the original post, I just shared a photo tutorial of how I got the look. I had actually prepared and edited a video tutorial as well, but my SD card went missing shortly there after. I thought I had lost all that work forever! Is this a look you think you would wear? It looks nice! Love the 3D glitter pearls on it though. I love this 3D look! If I had my wedding nails to do over I would absolutely do something unique and fun like this. I knew nothing about nail art back then and wore a really boring French. This look is super fun and cute, but it doesn't scream wedding to me. It actually screams baby or bridal shower, because they look kinda sudsy! Almost like you captured a bubble bath on your nails, which is adorable! 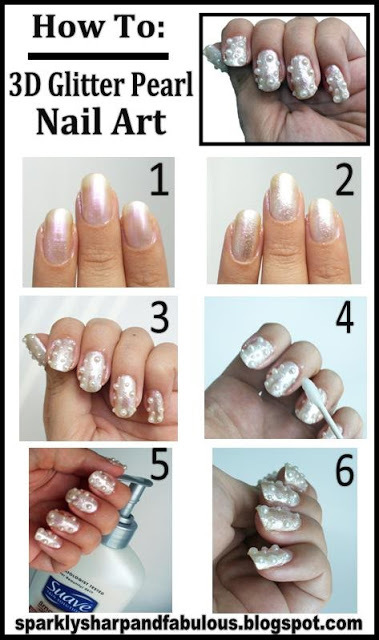 a nice simple way to use pearls, i agree with fixin to faff it looks like frosty water droplets on the nails.